"Raiders Pro Football Weekly: Oakland Raiders Pro Football NFL Picks, NFL Betting and Amazing NFL Raiders Football Coverage from mykaussie." Myk's Oakland Raiders NFL Footy webWORLD! Tues Oct 18, 2011. "Carson Palmer is now a Raider! I am now thus a bit more of a Raider fan! My three week 6 NFL bets includes the Raiders! This week I have gone for 3 underdogs. What a very unpredictable NFL season it has been so far. The Indianapolis Colts have had a average start to the season while the Redskins have played excellent at home, this game is in Washington. It is the +3.5 that made me decide on betting on the Redskins. Also several of the NFL experts on the NFL Network believe the Redskins will win this game. Should be a close game. This should be a great game as the Ravens travel to New England to take on the Patriot. I think the Ravens will win in a close game. Raider fans sorry about the Steelers jersey below. From Moose "Oakland Raiders, 47th year. One AFL title, Three of four in Super Bowls, one win in Los Angeles. 2005 Record: 4-12-0. Coach (back from 11 seasons ago!) Art T. Shell. QBs: Aaron Brooks (Yikes! ), Marques Tuiasosopo, Walter Green. Other Key players: LB Henri Crockett, OLB Thomas Howard, S Mitchell Huff, K Sabastian Janakowski, DE Lance Johnstone, CB Duane Starks, DLm Warren Sapp. What next? It was a real pity to see 75 year old Al Davis in his walker at the Hall-of-Fame proceedings earlier this month but time waits for no man. He did give a great talk to intro Big John Madden (112 wins faster than any Coach in Pro Football history). Gone from last years' 4-12-0 disaster, if you want to call them a team are: Coach/Offencive Coordinator Norv Turner (thank god! ), QB Kerry Collins (could be a BIG mistake) and many more vets, as the Raidahs cleaned house. So after interviewing several semi-interested candidates, Davis picked 'One of their own', in Art Shell, who Davis says, "Never should have left" Well, Al, you FIRED him! Shell won 58% of his games and in the meantime, he Ast.H.Coached the Falcons to their only Super Bowl appearance and Coached the hated Chiefs (THE CHIEFS!) Offencive Line and Exect. Dir. NFLE. Shell doesn't have much to work with. WHEN YOU LOSE for Al Davis, you get a quick bus ticket, as Turner and Collins found out. "If you would like to add your comments about how you think the Raiders will go in 06 or comment on Moose's preview above please email me myk@mykaussie.com and I will add your report. Wow! The Raiders had a huge signing in the offseason as the best WR in the NFL Randy Moss left the Vikings for the Raiders. This may seem weird to many NFL fans but I�m a Bronco�s #1 have always liked the Raiders. With Randy Moss there from the Vikings who have been my equal 2nd favorite team I will definitely be rooting for the Raiders in most games this season. Now I�m back in Vancouver I also hope to make a trip or two to San Fran to report on the Raiders along with visiting a company that backs the Java based Clipstream Video that you see throughout MYKwebWORLD and Total-CFL.com. I have met Warren Sapp at Pro Bowl along with backstage at the Jimmy Kimmel show along with also meeting John Parella when he was a Charger and many of the guys at Super Bowl 37 Media Day A extra special good luck to the Raiders now that Randy is there. From Moose �Oakland Raiders, 46th year, Coach (?) Norv Turner [for how long?!} QBs: Rich Gannon (can he come back? ), Kerry Collins (have gun, will travel) and Marques Tuiasosopo, draftee Andrew Green. Other Key (?) players; DLm: Warren Sapp, Akbar Gbaja-Biamila, [John Parella, three Super Bowl losses with three teams, has retired], RBs: Zack Crockett, Tyrone Wheatley, K Sabastian (Seabass) Janikowski, WR: Ronald Curry and big recruit Randy Moss Outlook: Two ways to look at Da Raidahs in �05; Bad and Worse. Well�not as bad as the Giants, 49ers, and Dolphins, especially since Ricky (ZigZac) Williams is back, man. If Rich Gannon can play and has anything left in his 39-year-old QBing body, not bad, maybe 8-8-0 or 8-7-1. But if Mr. INT., Kerry Collins or injury-prone Tuiasosopo are pivoting this club � they�re doomed. OAKLAND (3-6): QB KERRY COLLINS has 230+ passing yards in past 3 games & is completing 55.4 pct. of 4th quarter passes (41 of 74)��RB TYRONE WHEATLEY has 3 rushing TDs in past 2 games. Wheatley is 5 for 5 in 3rd & 1 rush attempts. RB AMOS ZEREOUE has 3 TDs through 9 games; scored 2 TDs in all of 2003 w/ Steelers. Zereoue has catch in 8 consecutive games��WR JERRY PORTER has 4+ catches in 6 of 8 games. WR RONALD CURRY stands 6th in AFC w/ 13 catches on 3rd down w/ 2 TDs. WR DOUG GABRIEL averages 17.9 yards per catch on 19 receptions. TE DOUG JOLLEY has 147 rec. yards on 10 catches & 1 TD in past 3��Defense ranks 4th in AFC in rush yards allowed per attempt (3.7). D-linemen TED WASHINGTON, WARREN SAPP, & TYLER BRAYTON have started every game this season��P SHANE LECHLER leads NFL with 48.5 avg. on 37 punts. No punter in history has averaged 50.0 yards for season. It is so cool to be the only Aussie that has regularly reported on the NFL for the past 5 years. 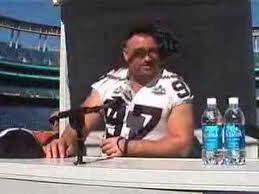 Tues Sept 14, 04 "Lots of Raiders MYKwebTV! Moose's Oakland Raider 04 preview! Raider fans and yes even though I am a Bronco #1 but also a Raider fan as equal #2. I was the only Bronco "Donkey he called me" ever allowed into MikGaz Raider Nation Black Dungeon in Montreal. I have interviewed champ Bill Romanowski several times, met Warren Sapp at Pro Bowl and backstage at Jimmy Kimmel Live, been to several Pro Bowl and filmed Rich Gannon and Tim Brown is one of my very favorite NFL Players. Raider fans you will love my MYKwebTV especially from Super Bowl XXXV11 and Pro Bowl when I ask the Raider cheerleader if she was responsible for Barrett Robbins going missing at Super Bowl. Refer to the video to the left at the top. Oakland Raiders, AFC West, Coach: Norv Turner, QBs: Rich Gannon, Kerry Collins, Marques Tuiasosopo, (WR/DB) Ronald Curry (possibly the best High School Player ever out of Virginia). Last year's disasterous Raiders ended the season with the QBing contingent of Rick Mirer (now with desperate Detroit), Tee Martin (now with desperate Winnipeg of the CFL) & Doug Flutie's old buddy, Rob Johnson, who's out of Pro Football altogether. Gone is Coach Bill Callahan, who opined that his guys just weren't smart enough to win four games. He was correct, especially after courageous Rich Gannon and athletic Marques Tuiasosopo got knocked out for the year. Enter ex- New York Giant Super Bowl starter Kerry Collins, who also had mix- ed results as a pivot in New Orlean and Carolina. Collins got bumped so the Giants could sign ex-Saint Louis and Arena Football star Kurt Warner. Enter big Ted Washington and Warren Sapp, DLm to help clog the middle of the line. Both are past their primes. Gone, to Tampa is Fairfax, Virginia's Charlie Garner. In comes new Coach Norv Turner, who never got things turned around in his six + almost seven seasons in Washington. The offencive line is the key and as long as the Raiders try to re-cy- cle Super Bowl AWOL Barret Robbins, they are trying to swim upstream. Barry Sims, Lincoln Kennedy, Adam True, Brad Badger are good, but fading away. Huggy's Bear's boy, Justin Fargas is fast but a fumble-prone back who should never be a starter on a good team, which the Raiders are not yet. On the Defencive Line: John Parella, poor guy - he's lost three Super Bowls with three teams, teams with Sapp, Washing- ton and quick end Akbar Gbaja-Biamila (try saying that five times real fast). Chris Cooper adds depth, but not enough. The Raider are in a touch division since realignment; Denver and Kansas City are infinitely better and San Diego is much younger and has three good QBs. With Bil Romanowski, Hall-of-Fame bound after a great but controversial career (Five Super Bowl appearances, the only LB in NFL history to do it), the rest of the crew here are: Napoleon (There always seems to be a Napoleon on this team) Harris, Dwayne Rudd, who used to be very good with Minnesota and Donnie Green, these are the starters, god help the Raiders! The big decision in camp seemed to be where to permanently move talented perennial practice squad QB, Curry. He will play WR after the release of Tim Brown, who was reunited with Jon Gruden in Tampa Bay. The other Receivers are: Doug Jolly at TE, Romanowski's old punching bag Roland Williams. "I'm sure there is a Raiderette in there somewhere! Mates Melissa the Dallas Cowboys cheerleader in the Blue & White is my friend. The #1 Dallas Cowboys & Pro Bowl cheerleader Melissa came to Calgary for a tanning promotion not long after I met her at Pro Bowl 2002 week. I met up with Melissa briefly that day in Calgary. Melissa has been a "Myk's Mates Club member" for the past year enjoying my MYKwebTV & comedy webWORLD.